Happy Talimpu Anniversary and a very Happy Ugadi to all my Talimpu.com visitors. Ugadi Pachadi is a combination of 6 tastes. Bitter / Chedu (from neem flowers), Sweet / Teepi (from jaggery), Sour / Pulupu ( from tamarind), Salty / Uppu ( from salt), Spicy / Karam ( from green chile) and ogaru / astringent (from tender mango). 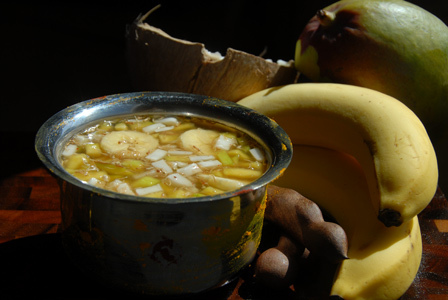 Makes : around 2 Cups of Ugadi Pachadi. Soak tamarind in a 1 1/2 Cups of water and extract all the thick pulp. Strain the tamarind and collect all the liquid in a mixing bowl. Add grated jaggery to the mixing bowl which has the tamarind liquid. If using dried neem leaves, soak in few tablespons of warm water before adding to the above mixing bowl. Wash and finely chop the raw mango discarding the seed. Finely chop the fresh coconut pieces. Mix all other ingredients into tamarind and jaggery liquid. Mix thoroughly and adjust any seasoning if required. Serve a small bowl full of ugadi pachadi. Notes: If using banana, make sure to add it just before serving. Suggestions: Adjust the amount of ingredients to make it more sweet, sour or spicy. Pluck the leaves of the neem flowers and add it for much milder bitterness. Whole raw peanuts are boiled on low flame for few hours along with spices. 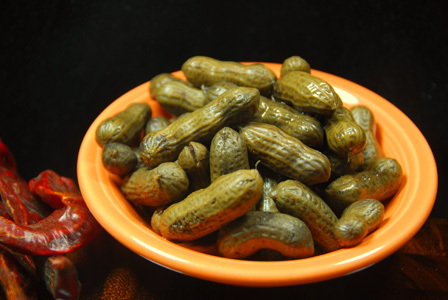 The spicy boiled peanuts are then strained and served. In a huge sauce pot, add whole peanuts, red chiles, salt and pour water to cover all the peanuts. On high flame, bring the water to a bubble and then boil the peanuts on low flame for around 4 – 6 hours. Make sure there is enough water in the pot all the time to avoid burning the peanuts. Alternatively, you can pressure cook the peanuts for 4 – 5 whistles and leave it for around 4 hours before straining. Strain the boiled peanuts and serve immediately. Notes: Make sure to adjust spice with red chillies. Suggestions: You can also add red pepper flakes in place of the whole red chiles. Also you can add bay leaf and few whole black peppercorns if desired. Variations: Check other recipes with peanuts here. Other Names: Spicy Boiled Peanuts. Khayam is usually mixture of around 10 spices. It is a favorite of Lord Krishna. The following recipe is a simpler version of khayam with 5 ingredients. 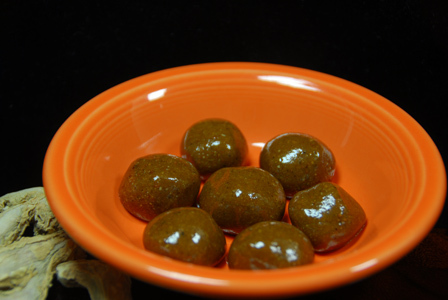 Spices are fried in ghee and ground into mixture with jaggery and made into small balls. khayam is stores for few days. Makes: around 10 Servings of Khayam. Heat ghee in a small pan on low heat, add all other ingredients except jaggery. Fry till the spices turn golden in color and remove from heat. Cool the roasted ingredients into fine powder using a spice grinder. Then add the jaggery and grind again. Form small balls with the ground spice mixture. Notes: Make sure not to burn any of the ingredients while roasting. Suggestions: Adjust jaggery according to spice level. Variations: Add more dry ginger or carom seeds for hotter version. Roti batter is prepared with idly rawa and urad dal. The batter is then fermented and made into thick rotti. 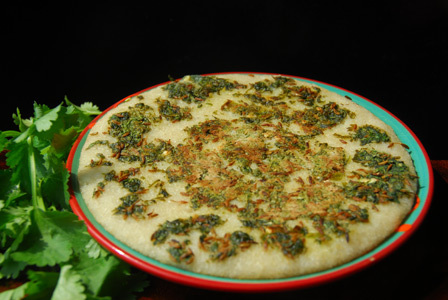 The rotti is layered with freshly chopped cilantro and spice mixture. Once the cilantro rotti is cooked, it can be served with coconut chutney or sambar. Makes: around 5 Spicy Cilantro Rotti. Leave the idly batter in a warm place for around 8 hours. Remove stems, wash and chop the green chiles into circles. Using a pestle, lightly crush the green chiles and cumin seeds with few pinches of salt. Layer the rotti with crushed cilantro mixture. Cook the roti for another 2 minutes on a low flame for cilantro leaves to cook and crisp up a bit. 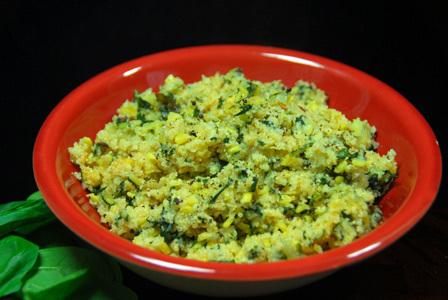 Serve cilantro rotti with coconut chutney or with sambar. Notes: Refrigerate the remaining batter for a week or two for more cilantro rotti. Variations: You can also mix the cilantro mixture into the batter instead of layering it.